Individual Unitarian Universalists and some Unitarian Universalist congregations have been engaged in racial justice work for decades, but only since the 1992 General Assembly resolution entitled “Racial and Cultural Diversity in Unitarian Universalism” has the Unitarian Universalist Association (UUA) made a sustained effort to address racism as a systemic issue. Racism was raised as a theological issue in the 1996 report to the General Assembly entitled Journey Toward Wholeness—The Next Step: From Racial and Cultural Diversity to Anti-Oppression and Anti-Racist Multi culturalism. 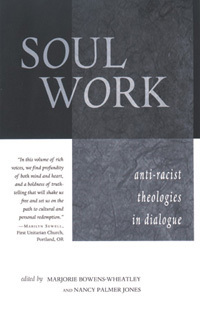 Following the 1997 General Assembly’s adoption of the resolution, “Toward an Anti-Racist Unitarian Universalist Association,” the Association began to play a decisive role in work that was intentionally focused on anti-racism—not only as an institutional and structural issue, but also as a spiritual issue. In the ensuing years, as leaders and participants continued ever-deeper engagement in the work, it became clear that the spiritual dimension of anti-racism is of critical importance. So why theology? Because, as part of the spiritual quest, theological reflection helps us to test our beliefs, assumptions, and religious values in relation to the experiences and viewpoints of others. Are racism and violence, for example, social construction or aspects of human nature? What is our epistemology? In other words, how can we respond with certainty or proclaim “the truth” about racism when we live in a pluralistic world? How do we know what we know (or think we know) about racism, about social systems, about injustice in the world when our social location may not mirror the worldview or experience of one whose social context is quite different? How can we respond with certainty or proclaim “the truth” about racism when we live in a pluralistic world where racism manifests itself in radically different ways? These are cutting edge theological questions that particixiii pants begin to engage. Through theological reflection, social engagement, and discourse with others, our perspectives deepen, and sometimes change how we respond. Our spiritual yearnings are not fully coherent without such theological engagement and subsequent integration into our lives. This is part of what faith development means—in light of new information, we are called to reconsider everything we “know,” everything we have put our faith and trust in.